The team had only just welcomed in the New Year when they were called out to this injured white rhino cow. Injured in a skirmish with a bull and with a young calf at her side the team treated the injury to her teat and a full recovery was expected. In late January the STS team paid a visit to Seha to check on her progress. Her wound has not really improved as they hoped over the last week so it was decided that a new approach was needed to treat her wounds. This would be the first of several visits throughout 2018. In January, the Saving the Survivors assisted in the successful relocation of a male cheetah who had previously been treated by the team for a foot injury. 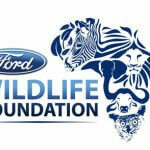 The cheetah was being moved from a reserve in Gauteng to KwaZulu-Natal. 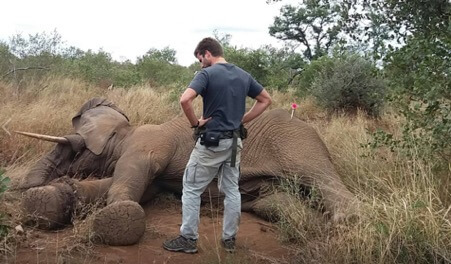 In February, in southern Mozambique, there was a deliberate poisoning of an elephant carcass. This poisoning affected over 100 critically endangered vultures including the death of at least 80 African White-backed Vultures and seven Hooded Vultures. Dr Joao and the team attended alongside the EWT to treat affected vultures and prevent any additional casualties. The STS team were called to attend to a 6-week old elephant calf who was sadly abandoned by its heard. After a check-up, the team discovered that the gait of his left hindlimb was abnormal and proceeded to sedate the calf in order to take a closer look via radiographs. 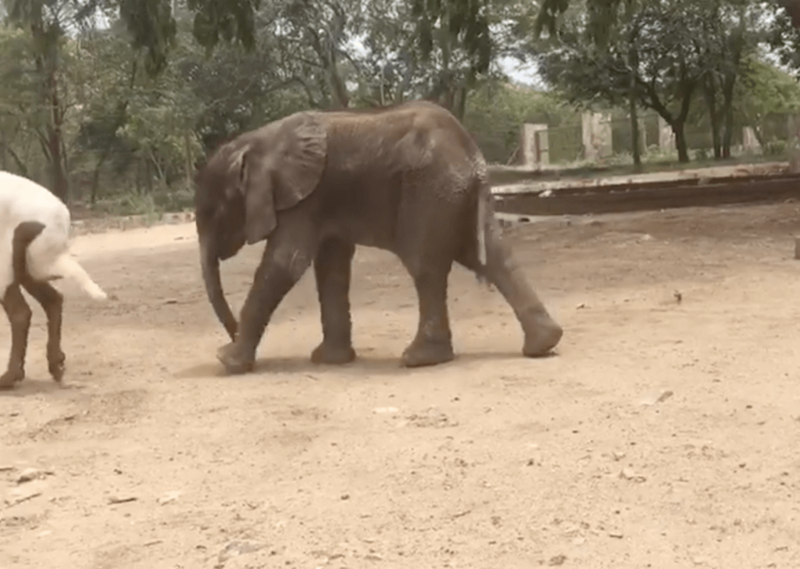 Once rehabilitated, the calf will be reintroduced to the reserve where he will be mixed with other elephants in the reserve or form a new heard with other orphans. 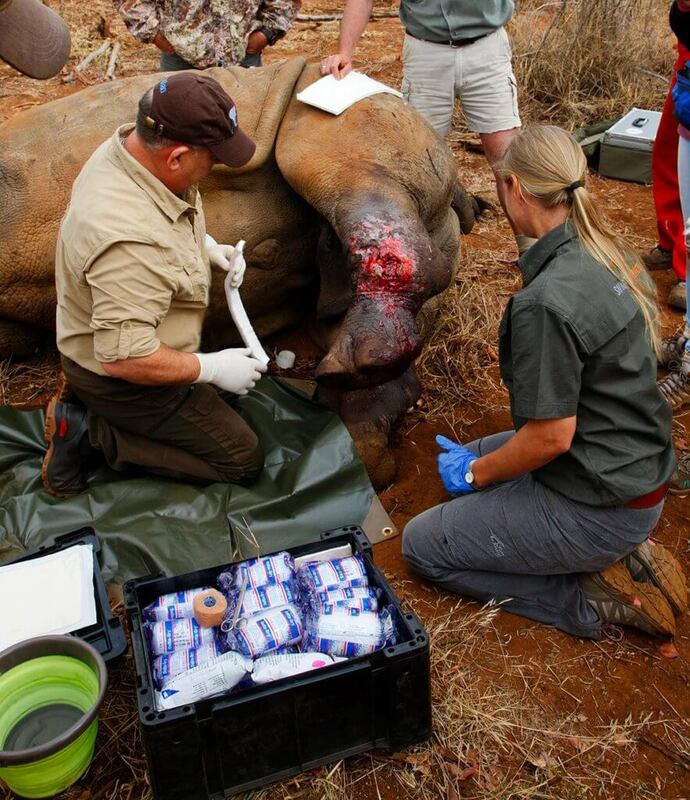 Dr Johan and Zoë attended to Thembi, to check-up on an old wound caused by poachers. They discovered maggots and inflammation which meant she was having difficulty breathing. 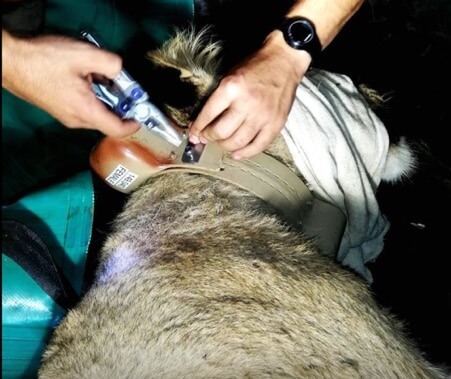 The STS team quickly treated and dressed the wound before applying the fibreglass covering which helps to protect it, after 24 hours, Thembi was breathing normally again. On 19th March 2018, the world’s last male northern white rhino sadly passed away. Sudan was being treated for age-related complications that led to a number of degenerative changes in his muscles, bones and skin. Throughout his existence, Sundan significantly contributed to the survival of his species as he sired two females. Sadly his death leaves just two female white rhinos on the planet. 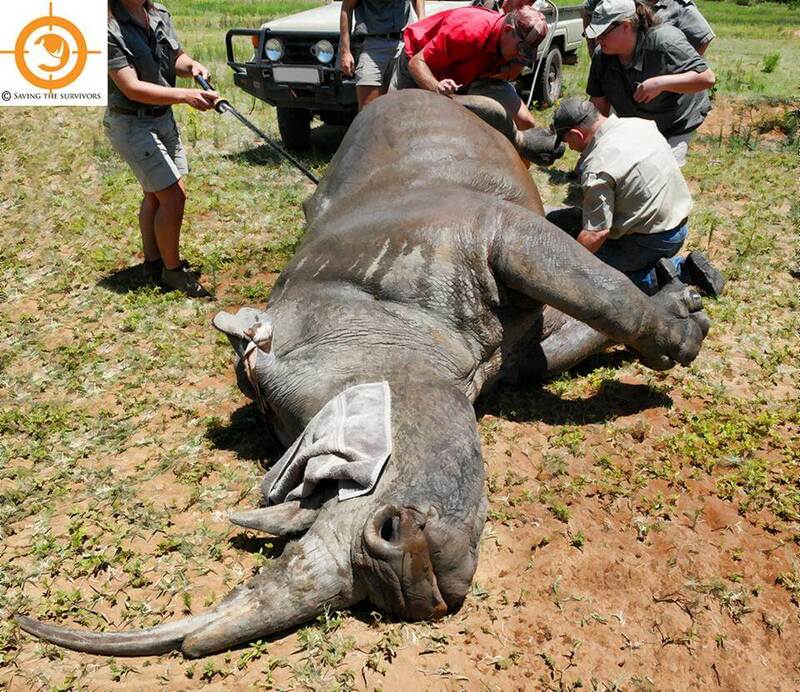 The STS team were called out to attend to a white rhino cow that had been shot in the upper back. 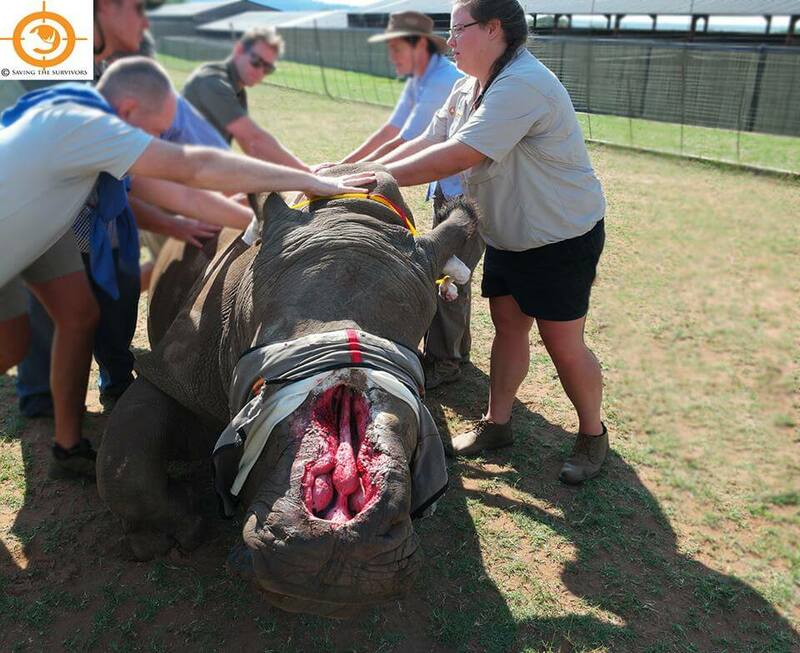 The rhino named Micaela was given anaesthetic before the attending team located and removed the bullet. The wound was treated and Micaela was given an antibiotic with the team hopeful she will make a full recovery. The STS team travelled to Limpopo province in South Africa to attend to a young buffalo cow who had a severely infected growth on the side of its neck. Dr Johan Marais safely removed the growth and stitched the buffalo back up and the team were positive the buffalo would make a full recovery. 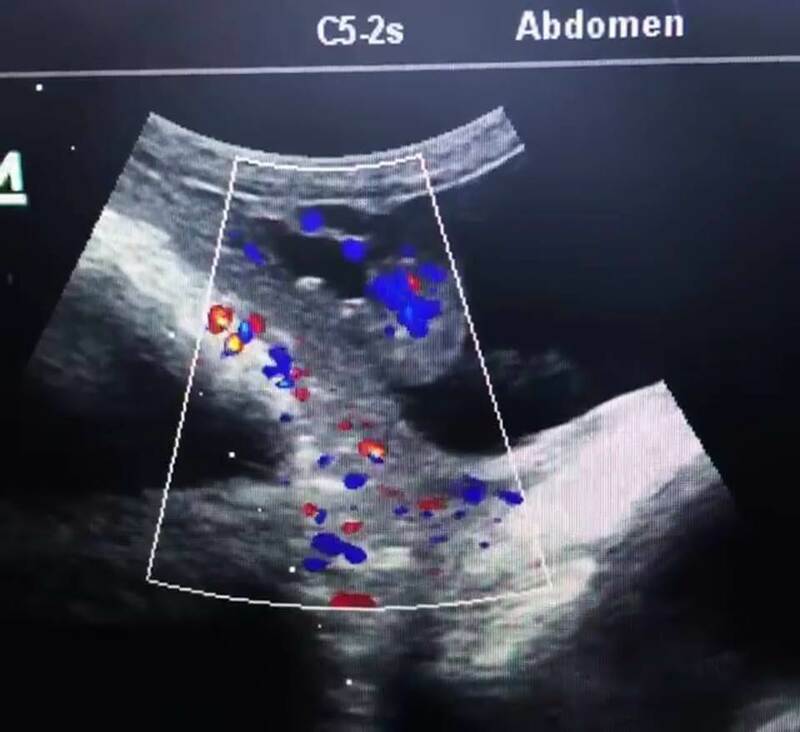 White rhino bull, Seha has successful rebred and the news broke in March that he will be a father. Seha was brutally attacked by poachers in 2016, both of his horns were hacked off and five other rhinos were killed during the attack. 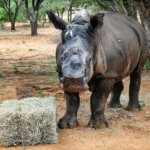 It was a long and painful rehabilitation process for Seha but the news that he has successful bread with white rhino cow Lucky is excellent news for the species. Assisting the Endangered Wildlife Trust, STS helped with the formation of a new African wild dog pack. The dogs are sedated, and the female dogs are rubbed against the male dogs as a way of bonding. Once the sedatives wear off, the dogs are left to get to know each other in an enclosure. The method, developed by the Endangered Wildlife Trust, worked exceptionally with no signs of aggression between the dogs. 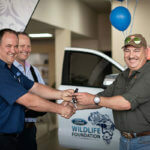 In April, two wildlife charities joined forces to tackle the ever-rising threat to wildlife in South Africa. Their joint ambition was to combat the impact of poaching head-on and delivering a wider conservational strategy through their own initiatives and by supporting other global projects. Saving the Survivors journeyed to Namibia in May to assist with a white rhino bull who had been shot. The bullet penetrated the joint, causing fractures and a septic joint, which resulted in the bull being quite lame. The team cleaned the wound, flushed the joint and placed the limb in a cast, which isn’t easy with such a big animal. A rhino that fell 60 foot off the edge of a cliff was the centre of a rescue mission in May. 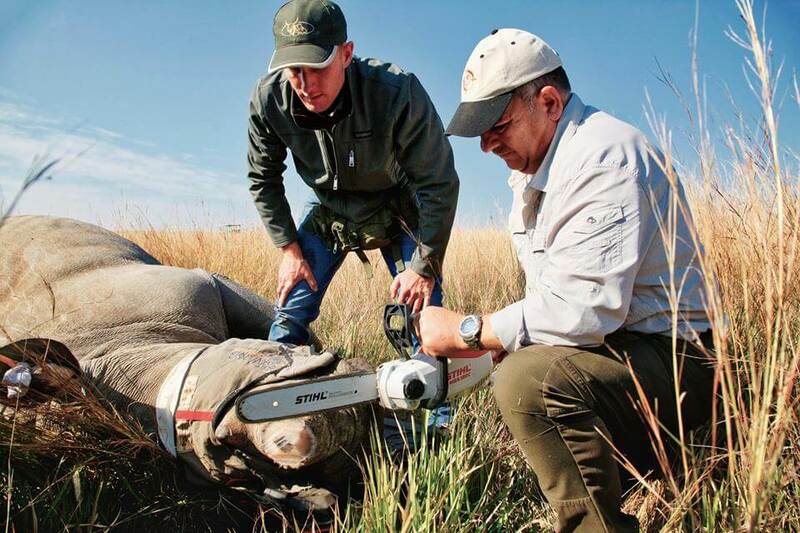 Although the rhino was not injured during the fall, he did fall onto land where he was at risk from poachers. This was the third attempt to relocate the rhino back to his home, unfortunately, it was unsuccessful, and a military helicopter is needed for the next attempt. Saving the Survivors successfully captured three beautiful cheetahs for relocation to a new reserve. A few weeks later, the team at Endangered Wildlife Trust released the cheetahs into their new home. Seha was poached in 2016 and was left with horrific facial injuries. The STS team have treated him many times and 2 years later, his condition continues to improve. Dr Glyphis darted him and Dr Marais cleaned and treated his wounds, everyone was pleased with his progress and the team will be back in 6-8 weeks to again check on him. 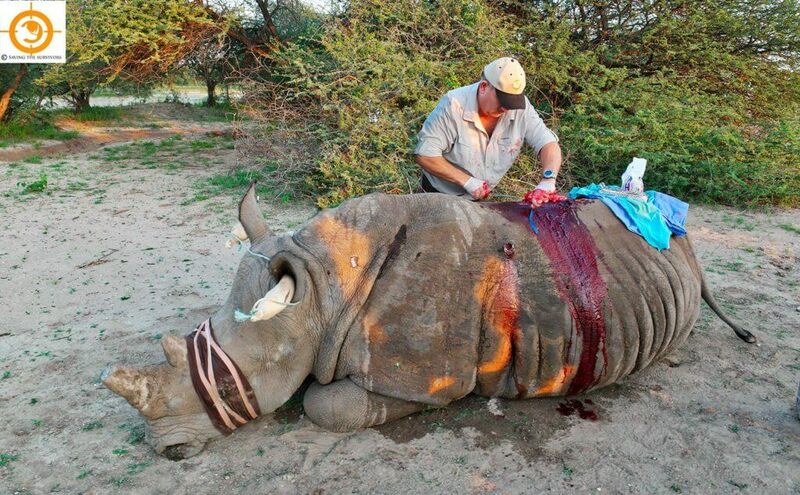 The dehorning of rhinos is becoming more common as a means to deter and protect these animals from poachers. 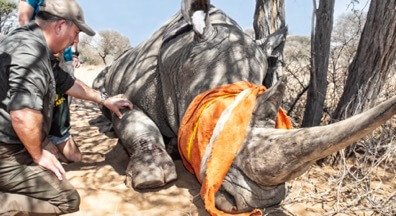 The procedure offers a small amount of protection from poaching for the horn and is carried out by members of the Saving the Survivors team. Saving the Survivors have been selected as one of the charities to take part in the GlobalGiving June accelerator. This opportunity gave the charity a chance to become permanent members of the GlobalGiving community. 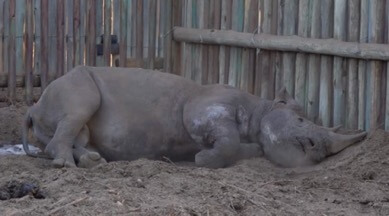 Thembi, the rhino who was poached two weeks prior has been reunited with her calf. The STS team worked hard to treat Thembi’s wounds and she was deemed well enough to be back with her calf who had clearly missed her a lot. Saving the Survivors is thrilled to announce they are expanding their work into Mozambique. This expansion will ensure the entire country is equipped with effective fast-response wildlife veterinary services. A 12-year-old bull elephant was the latest victim of a snare when he became caught in the wiring that is often designed to capture smaller wildlife. His leg was caught in a double cabled snare which caused significant injury, reaching deep down to the bone and causing substantial swelling and infection. The team treated Titan and they will revisit him and monitor his recovery. A white rhino bull named Mr T was injured during a fight with another bull. The rhino was lame on his left hindlimb, and on taking radiographs, the team concluded he had sustained a fracture of the lower tibia. The limb was cast and the team will return to monitor his recovery however Mr T has already lost weight and the fracture is infected. In July, STS were thrilled to announce that Dr Joao Almeida would be joining the team following the charities expansion into Mozambique. 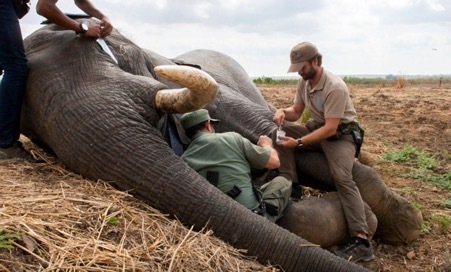 Dr Joao is a highly-respected wildlife veterinarian with over 8 years’ experience and will be an invaluable addition to the team and work of STS. Working closer together to protect the worlds most poached animal on the planet, Saving the Survivors has partnered with the African Pangolin Working Group and Johannesburg Wildlife Hospital. Together they will work to combat the poaching of these animals and care for those who have been injured. In August, Saving the Survivors announced that they have partnered with Craghoppers who will supply Dr Johan and the team with their kit. The STS team were called in August to assist with a rhino calf who was sadly rejected by her mother at around 6 months old. It is unknown why she was abandoned but after a few attempts to reunite the mother and daughter, it was clear the calf needed to be cared for by someone else. The team darted and transported Cassie the calf to a rhino orphanage where she will be cared for by the staff. A white rhino named Lucky was attacked by poachers where she was shot twice in the back and had both of her horns hacked off. With devastating injuries, Lucky survived and was treated by the STS team. Her wounds were cleaned, treated and disinfected and a cast was put on over the nasal cavity bones, protecting the large and more severe wound caused by hacking off the frontal horn. Two female lions were immobilised and fitted with GPS collars by the Saving the Survivors team. The lions are part of a pride of 13, and the GPS collars will allow Greater Limpopo Carnivore Program (GLCP) to improve the protection of Lions by understanding the pride’s movements, population dynamics, cub survival rates, prey preferences and habitat use. Samples were also taken which will be used in a global study on lion diseases. Saving the Survivors headed to Niassa National Reserve to assist in the translocation of 50 zebra and 50 wildebeest from NNR to Gile NR. The STS team will immobilise the wildlife for transit, collect blood samples and fit GPS collars for post-release monitoring. Sad news came on September 15th, 2018 when Saving the Survivors announced the passing of Spartacus, a rhino who had been the victim of poaching. The injuries he sustained from the poaching were too much and he sadly passed away on the 14th September. A magnificent male white rhino became the latest victim of poaching when he was shot in the front limb. Thankfully, Sunblest managed to survive and his horn was not taken however he did severely injure his leg that caused a lot of pain and difficulty in mobility. Two of the three bones had been badly affected and the STS team decided to treat and cast the limb. The team will regularly visit Sunblast to monitor the injury and replace the cast. Niassa National Reserve is the largest protected area in Mozambique, and it is home to Mozambique’s largest populations of elephants, lions, and wild dogs. This project will see improved elephant protection by increasing ranger patrols and deploying 40 satellite radio collars so that 3-5% of the remaining population can be tracked continuously. On 26th October, STS made the sad announcement that a white rhino bull that had been shot by a poacher in August had passed away. 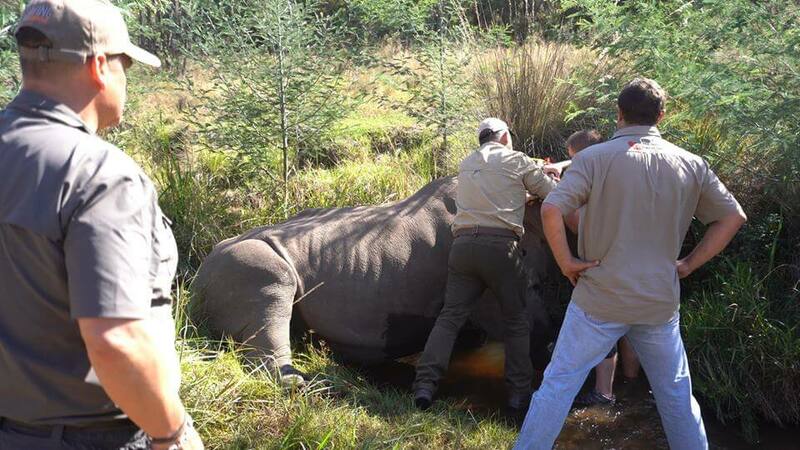 The rhino was treated several times however his condition worsened, and the decision was made by the team to euthanise him. The STS team were called by ANAC officials to assist with an adult pangolin who had been caught by poachers. 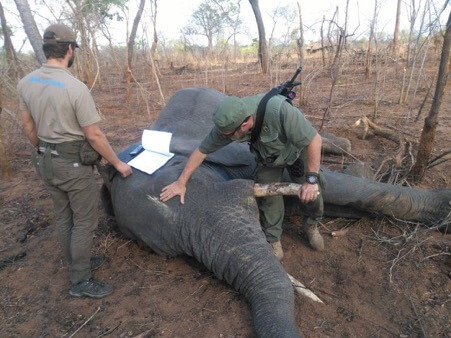 The poacher was apprehended, and the team got to work assessing the injured animal. Despite being very stressed and dehydrated with superficial wounds, the pangolin was overall strong and healthy. The team took the endangered animal to a secure game reserve for observation. After a short period of observation, the pangolin was deemed fit enough to be released into its new home in southern Mozambique. In Niassa reserve, the STS mobile vet unit was called to assist with a young female pangolin who had been caught in a snare. The pangolin is the most trafficked mammal in the world and this one was badly injured; its left arm had been amputated by the wire and a severe infection was developing. Pangolins use their arms to forage for food and a pangolin with only one arm has no chance of recovery. For this reason, the decision was made for the pangolin to be euthanised. The STS team were called to yet another brutal poaching of a rhino. 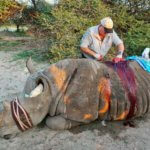 Harvey had suffered a horrific injury at the hands of poachers who had hacked off his horn leaving a massive open wound. The STS team worked quickly to immobilise him, clean and dress the wound. Dr Johan Maris is confident the wounds will heal, and they plan on returning several times to treat the wound and ensure he is recovering. 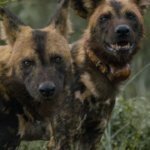 Saving the Survivors and the Endangered Wildlife Trust came together to begin an historic wild dog relocation project. The first stage will see the dogs bond before being relocated to a conservation area in Mozambique before being released into the wild. In November 2018, the Saving the Survivors team were high in the sky looking out for an elephant to place a tracking device on. They successfully managed to dart a tremendously large male. 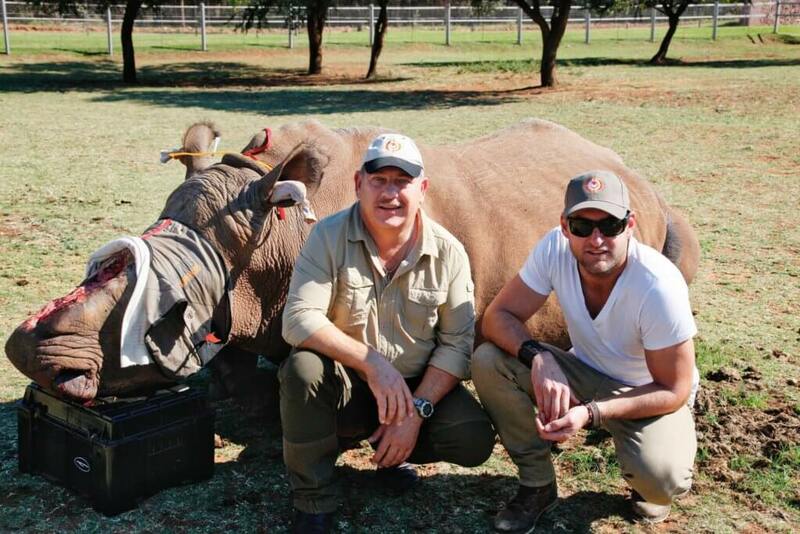 The tracking collar will help anti-poaching units increase their patrolling effort around the heads home range. In November 2018, Saving the Survivors were called by Karingani Game reserve and Kruger National Park rangers after they discovered a female lion who was caught in the South Africa / Mozambique fence. The lion had been trapped for 9 hours with injuries to both of her back legs. The lioness was released, treated, given a saline solution to help with the dehydration as her cub looked on from a safe distance. She is expected to make a full recovery. 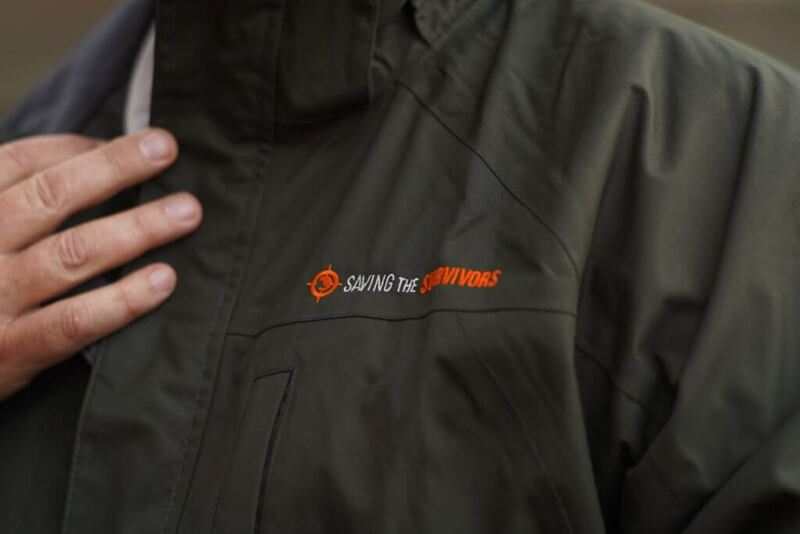 In November, Saving the Survivors announced the launch of their official merchandise. From mugs to t-shirts and cuddly toys, 100% of all proceeds go towards supporting the work of Saving the Survivors. On the morning of the 4th December 2018, a critically endangered black rhino cow was poached and killed in Mozambique. The STS team attended to collect biological samples, perform a post-mortem and locate the bullets for forensics. There are less than 2500 black rhinos left on the planet, making this rhino death, even more tragic. Local herdsmen in Mozambique called STS to assist in an ongoing conflict between the cattle herds and herdsman and two buffalo bulls that have been sharing the same territory. The herdsmen were concerned about disease being spread and so with the assistance of Sabie Game Park staff and ECO APU, the buffalos were transferred back to the GLC reserve. The tracking of animals in the wild is vital to better understand their behaviour. In December STS collared a subadult cheetah from a litter of 4 which will help to monitor her movements, especially once she starts hunting. STS team assisted Peace Parks Foundation, SANPARKS and ANAC in the translocation of 72 wildebeest from South Africa to Zinave National Park. The groundbreaking reintroduction of animals into Zinave National Park is part of a series of actions that aim to rehabilitate one of the most beautiful and ecologically diverse National parks in the country. In August 2013, two cows were poached on a game reserve in Kruger National Park. Despite both of the cows losing their horns, they survived and underwent several treatments with the STS team. After a long healing and rehabilitation process, it was announced that both cows will be integrated into the larger reserve and they were released in December. 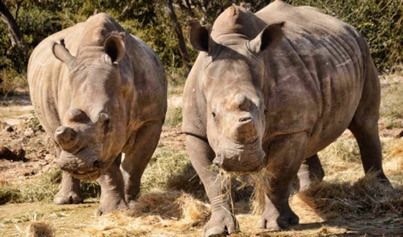 Good news as the poached white rhino bull, Harvey has made such progressive improvements that the Saving the Survivors team believe that he needs only one more treatment before he is fully healed.